NEW HAVEN, CT (CelebrityAccess) — Work is underway to reopen a theater in downtown New Haven that has been dormant for more than a decade as a music venue. 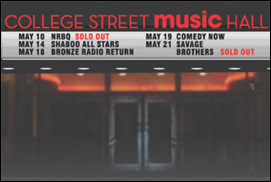 According to the New Haven Independent, the former Palace Theater will be transformed into College Street Music Hall, a venue with a capacity of up to 2,000 patrons. The hall will have multiple configurations, with theater seating, cabaret-style table seating or a combination thereof. Before it will open, the building will undergo $80,000 worth of rehabilitation. The venue will be booked by Keith Mahler, a promoter who runs Premier Concerts, a Waterbury-based promotion company.